On the instructions of Special Assistant to CM Punjab, Khwaja Salman Rafiq, Punjab Health Department has issued orders to kill stray dogs. As many as 5,000 stray dogs have been killed in December 2012 alone. A nation can be judged by how it treats its animals. We in Pakistan now know where we stand. This killing of homeless dogs is exploding everywhere in the Province and the Health Department is declaring it as an achievement. The Lahore administration says that it killed over 27,000 homeless dogs in 2010 and a new killing spree is being planned for 2013, again under the “reason” that stray dogs are a health threat. The concerned Public Health Officer, making it sound like efficiency, says that dog killings are reported on daily basis to the district coordination office. 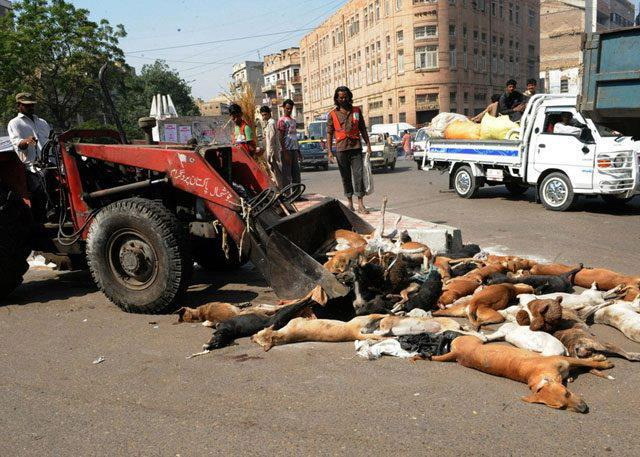 According to one official of the Administration, an average 50 dogs are killed daily in Lahore alone. Killing is committed via shooting or poisoning, for which special teams have been made by the local administration. These killing teams hunt homeless dogs in poor parts of the district, without confirming whether a dog is infected with rabies. As one would expect, these so-called “health defenders” have no data on how many dogs have been tested for rabies and how many cases of rabies resulting from dog bite are reported each day, let alone information on who is responsible for getting bit: the dog or the human. And to say more, around 100, 000 rupees are also being spent on shooting innocent animals. This is in addition to the salaries offered to the killers. The money spent on killing helpless, innocent animals needs to be spent on making Lahore a safe place to live. Can the local administration just try to understand this need? A dog understands human love and care, and I believe that those assigning dog killings are expected to be better than dogs. Maybe they will decide for themselves whether they have the courage to say “no” to a bad practice. A civilized way to handle homeless dogs is by building shelters for them. Abdul Sattar Edhi in 1988 built in 1988 a shelter for animals on a 4 acre area in Karachi now serves as home to stray cats, dogs and donkeys that are disabled and don’t have anyone to take care for them. If the Lahore administration could start such shelters with the same money that is currently being spent on killing dogs, cruelty and pain can be minimized on one level and positive living encouraged. In case these dogs are being killed because of rabies, the easiest way is to vaccinate them. An injection can kill rabies germs in a dog… after that a dog attack is no longer lethal. Send me official contact number.. Lahore main ek awara or dangerous billa ha Jo paltu animals ko ly jata ha. Insaan k kuch kehny py nahi darta wo billa. There is a monster lizards….in our area johar town lahore …..kindly tell any organization who kill them……i m very thankful to u.
Monster lizard may look scary but will not be harmful. I know that stray dogs can be scary. But please don’t get them killed. What is their fault? Try to get them a shelter. a cartoon is being done by me webliography to get a class in senior school and an online book was required by us. I adored the create of the idea along with one’s site of it being expert modified, so it was used by me in my own presentation. Kindly visit in awan market Lahore yaha buhat awara kuty hyn or humy Mushkil hoti hy jb kbhi bachon ko bar bejna ho..
Sir kiya koi awara kutto ka rabtay ka number mila for catcher ?